Well, have you ever seen a fish smoke? I hadn’t until tonight, where I witnessed a young spiky cod of sorts smoke half a cigarette. It sucked it in like a true smoker and spat it back out twice, both times after having had half a dozen good draws. Deep sea toker. If only I’d had my camera, but perhaps this wasn’t a paparazzi moment. Fish have honor and deserve a certain amount of respect too I’m sure. Three of us had been out amongst some small stony buildings somewhere on the lovely little road between Tivat and Kotor, helping to haul in some net lines full of silver glow in the dark sardines, and returned to the frozen seafood shop in town to see where all the big and little fellas went to die. My friend tried to pull a bloated flathead of sorts out of the tank but it wouldn’t slip into his grasp so he went for the little sister who was far tamer, or so I thought. Ten seconds later she had a fag hanging out and was chugging away like an old hand. I was waiting to see if it could blow the smoke back out through its gills, only later realising fish don’t actually breathe out, they just pass deoxygenated water out through their gill covers. I guess you learn something new every day. This one was just about as impressive and humorous as the Balkan crocodile hunt, though that’s another story. Ahh yes, good morning, first post. So here’s the story. After travelling for nearly a year and now having a grumpy back pocket and very sad wallet, I have found a place, a lovely wee place, to settle for the summer. 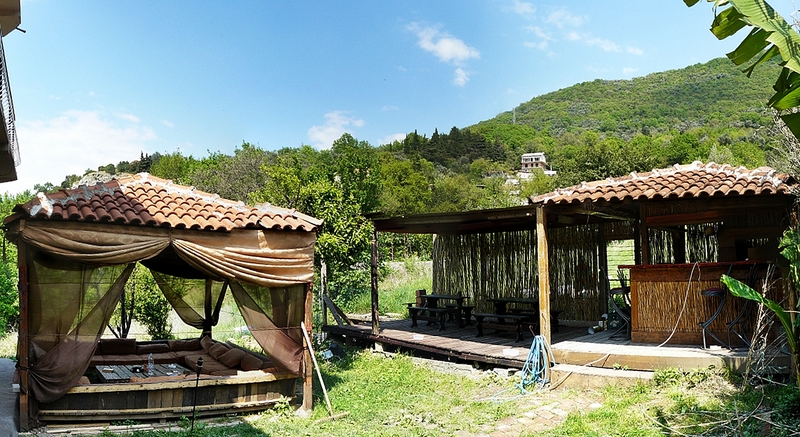 I even have a job, working at an awesome little family run hostel called Hostel Anton in Tivat, Montenegro. Živjeli to a summer on the Balkan Adriatic, it should be fun. I’m intending to use this blog to go both forward into the future as well as to reflect back on the past year of travels through Sumatra, Scotland, Morocco, Andalusia, Berlin, Poland, Slovakia, Serbia, Bosnia/Herzegnovia, Croatia and here. As for now, I’m sitting enjoying the spring looking out from our rooftop over Boka Kotorska, Boka bay, Montenegro.